← TELUS sponsored food bank drive in Sooke wraps up in a couple of days! Sooke Talks is back on Friday, May 3 from 7 to 9 pm in the EMCS Community Theatre to showcase a third fractal of the fascinating people living in our midst. 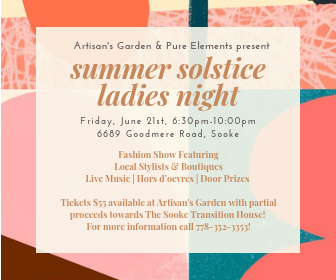 In a new twist, our line-up of speakers and audience energizers will be paired with a live auction of donated artwork and new paintings created in an “art battle” on the night itself by members of the Sooke Arts Council. Everyone is donating their time for this latest in a series of special fundraising evenings organized by the EMCS Society and Sooke Harbour Toastmasters on behalf of needed upgrades to Sooke’s community theatre. $15 tickets are available online at CanadaHelps and will be available at Shoppers Drug Mart, the Stick in the Mud Coffeehouse and the the EMCS Society office at Edward Milne Community School. David Mallet: Je Suis Acadian! Kimberly Anderson: Tools and lessons from a registered clinical counsellor and long-time Sooke volunteer about how to face the fear and do it anyway. To Be Announced: A current EMCS student among those now being trained in the art of public speaking by Ms. Ehman. Linda Green Abraham & Monica Reekie: Readings from the SAC anthology, Art & Word. Art Battle and Auction: Linda Gordon and several painter friends will be handed blank canvases and a theme at the start of the evening. They’ll then set up in the lobby and get busy. Visit them during the intermission, see them at work and maybe request a dash of red here, a bolt of blue there. Their finished canvases along with donated items from Sooke Arts Council members will be auctioned off during the evening’s second half. Funds will be dedicated to a new scholarship for exceptional EMCS arts students being established by the Sooke Arts Council. Join us at intermission to browse the silent auction, visit with our painters, and enjoy fundraising treats and refreshments courtesy Sooke restaurants, bakeries and shops. Tania Ehman is a coach for personal and corporate clients as well as speakers appearing at Vancouver Get Inspired Talks and TEDx Bear Creek. A gifted orator herself, Tania finished in the top-20 among more than 30,000 competitors at the World Championship of Public Speaking in Washington, DC. in 2016. The EMCS Society builds partnerships with students, parents and a diverse range of individuals and organizations while providing life-long learning opportunities for people of all ages in the Sooke Region. The Society books local school facilities, manages the Community Theatre and the Sooke Region Literacy Project, and oversees such initiatives as the Sooke Makerspace and the Play and Learn Summer Camp. Sooke Harbour Toastmasters is part of a world-wide network of local and international groups that empower members to develop communication and leadership skills through public speaking. Result: Greater self-confidence and personal growth. All are welcome to drop-in to weekly Wednesday night meetings from 7 to 8:30 pm at Ayre Manor. Sooke Talks #3 is organized by Frank Antonsen, Jeff Bateman, Rosanne Day, Tania Ehman, Linda Gordon, Tyler Roger Temple and Tracy Waters.